Peoria, IL – The Peoria Distillers allowed three unanswered runs to drop the middle game of a three-game series to the Wisconsin Timber Rattlers 3-1 on Thursday night. Peoria is now 19-12 in the second half and 58-43 overall with the series finale set for 7:00 p.m. on Friday night. The Distillers got on the board first in the bottom of the fourth against Timber Rattlers starter Nelson Hernandez. Elehuris Montero drew a leadoff walk, stole second base and Yariel Gonzalez moved him over to third on a groundout. Zach Kirtley delivered a single down the third base line to plate Montero for a 1-0 lead. Wisconsin answered in the top of the sixth against Distillers starter Paul Balestrieri. Darren Seferina led off with a triple and Zach Clark drove him in on a sacrifice fly to left as the score evened up 1-1. The Timber Rattlers moved ahead in the top of the seventh against CJ Saylor. Gilbert Lara hit a leadoff double and with two outs, Rob Henry scored Lara on a triple to right field as Wisconsin snagged a 2-1 advantage. The long ball helped the Timber Rattlers add to their lead in the top of the eighth inning. KJ Harrison belted a two-out solo homer over the fence in left to widen the margin to 3-1. 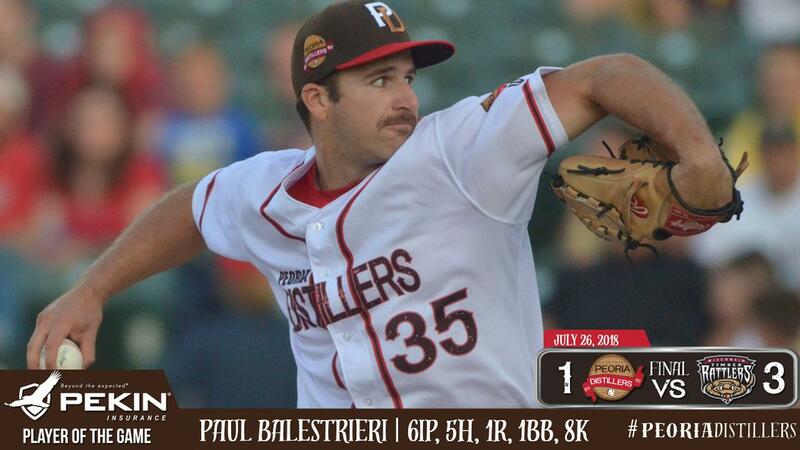 Balestrieri took a no-decision throwing six innings allowing one run on five hits with one walk and eight strikeouts. CJ Saylor (0-1) took the loss throwing two innings allowing two runs on three hits with no walks and three strikeouts. Robbie Gordon pitched a scoreless ninth allowing one hit with no walks and one strikeout. Notes… Balestrieri set a career high with eight strikeouts…Peoria is 52-10 when allowing four runs or less…Montero has a seven-game hit streak…Gonzalez has a six-game hit streak…Martinez has a six-game hit streak…Davis recorded his 11th multi-hit game of the season…Peoria’s starting pitching has 14 straight games with at least five innings…After throwing out Lutz in the top of the first, Rodriguez has thrown out 45 percent (27-for-60) of runners trying to steal…Peoria is now 1-3 wearing Distillers jerseys since 1917 when the original team changed their name to the Tractors…The series concludes at 7:00 p.m. Friday with post-game fireworks as the Distillers start RH Alvaro Seijas (3-6, 4.83) against Wisconsin RH Bowden Francis (5-7, 4.65)…Friday is Bradley Night and ALS Night…The Distillers themed jerseys will be auctioned off during the game to benefit the Peoria Historical Society…The broadcast can be heard, starting with the Pre-Game Show at 6:45 p.m. on www.peoriachiefs.com/listenlive and is also available on the Peoria Chiefs Network on the Tune-In Radio App…The game is also available to subscribers on MiLB.TV.